Some of us can't resist asian influences... I am addicted to Feng Shui decor and also about pretty much anything that can create a Zen feeling in my home. 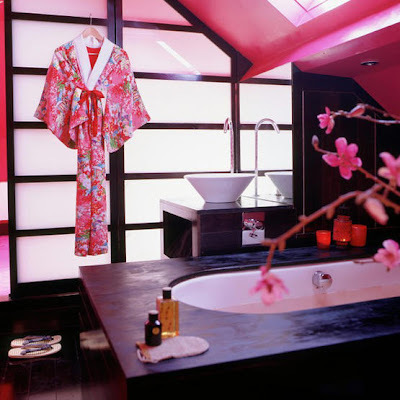 The other night, while doing some on-line research, I came across these fabulous images that show how to create the Perfect Zen Place, the pretty clear Asian elements have been enhanced by the use of bold colors, but always keeping it simple. I am crazy about this wooden tub top! not to mention the lovely Kimono!